Seeking My Life: How clever am I? Ah, the joys of working from home. I can hear my offspring come noisily from school, no matter how often DH reminds them, "Shhh, Mommy's working!". From my office, I hear the interrupted parade, as they both insist on watering the new plants before they've even unloaded coats and bookbags from school. Clever of me to pick the plot right by the front door for the herbs we planted over the weekend, eh? "I have to water my parsley!" -- music to my ears! Barley is loudly hunting aphids on the rosebush right outside my home office window--I sneak a peek at him, but don't linger. If he realizes he can get my attention through there, he'll be forever banging on the window to say, "Hi Mommy! Look at all the aphids today!" Barley did interrupt my conference call to announce that there was a bird in the bird bath--and it was splashing around! I didn't hit the mute button fast enough--the Manager I was talking with was very amused. Sigh. I have to admit, I am quite proud of the new birdbath. When we were first shopping for the garden, I noticed the bath prices were a bit high, so I picked up a clay saucer instead. Well, the spot where I had propped it up on rocks was too low, and the birds disdained it completely. 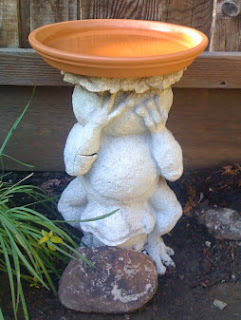 In an effort to convince DH that my $11 solution would work, to save us the $110 purchase of a completely unnecessary, but yes-indeed-nice-to-have legitimate birdbath, I looked around to see what else we had that I could use to prop it up higher. 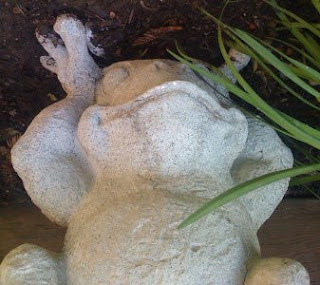 My eyes lighted on this plastic frog statue left by the previous owners. It has its front legs(? paws? flippers?) raised, and I think it must have held a flower pot once upon a time. Unfortunately, the fingers that are raised up are not even, and so won't hold the heavy saucer in a stable fashion. However, if I flipped hi m on his head, he does have a flat bottom! I moved it closer to the roses, wedged some rocks around his head and fingers (?) and placed the clay saucer on top. Voila! 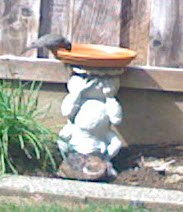 Here he is in all his funny glory, and to prove me right, the birds have indeed started to visit the new birdbath. And Barley got to see a bird actually splashing around in the middle, not just sipping from the edge. You can see why he felt this was more important than my call with a manager from my company! I could probably Dremel-ize the frog's fingers so they could hold the bowl evenly, but I have to say, I've grown accustomed to our upside-down froggie!